Brooklyn Army Base, New York, between the wars. Limiting the number to only the named and numbered vessels, discounting the various simple barges and amphibious assault craft, the remaining number is 14,044 vessels. This fleet and the Army’s Ports of Embarkation operated throughout the war’s massive logistics in support of the worldwide operations. After the war the Army’s fleet began to resume its peacetime role and even regain the old colors of gray hulls, white deck houses and buff trimming, masts and booms with the red, white and blue stack rings. An example may be seen in the photos of USAT Fred C. Ainsworth. Some confusion may exist in the precise definition of "Army ship" as many ships saw Army service during the Second World War that were never or only briefly (a brief Army time or voyage charter) part of the Army's fleet. Army owned vessels of the core fleet are quite clear, even though some of those switched between Army and Navy during the war. Close to those were the ships that were bareboat chartered by the Army, meaning that only the hull itself was chartered and Army was responsible for crewing and all other operational aspects. Others were long term allocations to Army by the War Shipping Administration so that they operated as Army transports and cargo vessels for much of the war. The more confusing ships are those that were short-term or time or voyage chartered ships. Philippine registered Dona Nati, part of "General MacArthur's fleet into 1942," one of three ships to successfully run the Japanese blockade of the Philippines. On 28 April General MacArthur reported that his fleet consisted of twenty-eight vessels — the twenty-one KPM vessels (the majority of which had not been delivered); the Dona Nati. The Admiral Halstead, the Coast Farmer, and the Sea Witch, chartered by WSA; and the Anhui, the Yochow and the Hanyang, believed to be chartered by the British Ministry of War Transport (BMWT) for the U. S. Army, though no official information concerning their status had been received. Three of those vessels, Coast Farmer, Dona Nati and Anhui. out of a number sent, managed to run the Japanese blockade of the Philippines and deliver supplies. After the war came the reorganization that led to the U.S. Department of Defense rather than a separate United States Department of War and Department of the Navy with the decision on maritime logistics going in favor of it being administered by the Navy. As a result, the Army lost almost all of its big vessels. Many of the Army vessels were transferred to Navy with the transport types becoming components of the new Military Sea Transportation Service (MSTS, now MSC) under the Navy. Some of the Army’s specialized vessels became Navy commissioned ships (USS) or non-commissioned utility vessels. Digital photographs of a few of these vessels in Army service are provided at the Naval History and Heritage Command. Others were sold commercially or simply scrapped. The Army heritage of civilian crewed transports and cargo ships continued in the operating model for MSTS and its “in service” non-commissioned ships designated as U.S. Naval Ship (prefix "USNS"). Some Army vessels, still crewed by Army civilians just transferred, were suddenly sailing before fully taking on the new service’s administrative functions and colors. The US Army Corps of Engineers has a total of 11 Dredge Vessels, divided into hopper and non-hopper dredges. In total the Corps has approximately 2,300 floating plant assets, including barges, tow boats, floating cranes, survey boats, patrol boats and dredges. Six Liberty ships were converted at Point Clear, Alabama into floating aircraft repair depots, operated by the Army Transport Service, starting in April 1944 to provide mobile depot support for B-29 Superfortress and P-51 Mustangs based on Guam, Iwo Jima, and Okinawa beginning in December 1944. They were also fitted with landing platforms to accommodate four R-4 helicopters, creating the first seagoing helicopter-equipped ships, and provided medical evacuation of combat casualties in both the Philippines and Okinawa. Six ships, allocated by the War Shipping Administration, were converted to repair and spare parts ships. Five, from 350 ft (110 m) to 390 ft (120 m) in length, were built on the Great Lakes from 1901 to 1913. The sixth, James B. Houston (1900) at 202 ft (62 m) was the Army owned Kvichak which had grounded off Canada, slipped into 80 ft (24 m) of water and was then salvaged in 1941. All were U.S. Coast Guard-crewed with the Army in administrative and operational control as well as providing the repair detachments from the Army Marine Ship Repair Company (AMSR CO.). All served in the Southwest Pacific Area. Houston, which had first served in the Aleutians, was declared surplus while at Mariveles, Philippines and turned over to the Foreign Liquidation Commission in February 1946, reverted to U. S. Army Forces, Western Pacific (AFWESPAC) in April 1946, but was not used as a repair ship after being declared surplus. This is a mobile maintenance and repair unit capable of traveling from installation to installation in a theater to perform third and minor fourth echelon maintenance and repairs to small boats, harbor craft, floating equipment, and in some cases repairs to larger vessels. The company is equipped with an especially converted ship or barge, fully equipped with machine, electric, engine, wood-working, rigging and paint shops. USARS James B. Houston (1900), part of 803d AMSR Co.
USARS W. J. Connors (1901), 804th AMSR Co.
USARS William F. Fitch (1902), first in SWPA, 801st AMSR CO.
USARS Duluth (1903), 802d AMSR Co.
USARS J. E. Gorman (1909), 803d AMSR Co. Co.
USARS J. M. Davis (1913), 805th AMSR Co.
Koondooloo 524 grt, 191.7 feet (58.4 m) X 35.7 feet (10.9 m) X 14.8 feet (4.5 m): Acquired for Southwest Pacific Area permanent local fleet, Small Ship Section, a double ended vehicular ferry built in Scotland in 1924 for Sydney Ferries Limited and converted in 1937 into a show/excursion boat with dance floor and 1,700 passenger capacity. Converted by the Army from coal to oil and fitted with a 30-ton boom, Koondooloo (S-181) was used as a workboat in New Guinea servicing amphibious vehicles and vessels. Reconverted to a vehicular ferry 1951 and wrecked while under tow to Philippines in 1972. "Half Rufus" was the bow of the Liberty ship Rufus King which ran aground on Moreton Island, Queensland, Australia. The ship had broken in two with the bow salvaged by the Commonwealth Marine Salvage Board, taken over by the U.S. Army Small Ships Section and equipped with vertical boiler for power, a machine shop used for repairing vessels and bunkers for coal and fuel oil for refueling them. Given the number S-129 and dubbed "Half Rufus" the salvaged bow was towed to Milne Bay, arriving 21 June 1944, and then to Finschhafen where repair equipment was transferred to a barge in April 1945 and the bow section then used as a coal hulk. Seven cargo vessels were converted to spare parts depot ships to facilitate the maintenance of military equipment in oversea areas. The 20 dry cargo barges originally intended for bauxite were taken by the Army and 17 were used in the southwest Pacific for storehouses. Of the 24 steam cargo concrete vessels, 17 were converted by the Army into floating storehouses, 5 were used by the Army as training ships and 2 found an honorable end when sunk to form part of the breakwater protecting the American landing in Normandy at Omaha beach. A. D. Kahn, "Concrete Ship and Barge Program, 1941-1944"
22 covered lighters (Army floating stores warehouse or BCL), 265 feet, used by Army as floating warehouses. 3 lighters used as refrigerated warehouses. 2 Army repair ships (Army repair ship or FMS). The Army had its own program for small boat construction and directly procured vessels and water craft that were under 200 feet or under 1,000 gross tons. Army F-ships (100-dwt) were little freighters built on the lines of a Dutch wooden shoe and had a capacity of about 100 tons with a maximum speed of 8 knots. During the war these little ships plied back and forth between Navy PT boat bases, Crash Rescue Boat bases, and Engineer Special Brigade bases in the pacific for the purpose of transporting personnel, hauling supplies and cargo, or occasionally for towing fuel barges and water craft, to bases along the coasts or to nearby islands. Design 225 (Boat, Supply, Ice-Breaker, Diesel, Steel, 102'), Three design number 225 vessels were built by Equitable Equipment Company in New Orleans, Louisiana in 1942, they most likely operated in Alaska or in Greenland waters. Eleven of these small ships were built for the U.S. Army Air Corps/Army Air Forces in late 1942 through mid 1943. The official designation was "Design No. 210, 150 Foot Steel Diesel Retrieving Vessel", sometimes termed "Aircraft Retrieving Vessel" in later references. Name format was "U.S. Army" over "H.A.# NAME" as indicated by a builder's model. Dimensions were 158' 3" LOA X 32' beam (moulded) at deck X 8' draft powered by two 300 hp diesels, and was equipped with a 30-ton jumbo lift boom along with regular cargo booms and had a cargo capacity of 500 measurement tons. These vessels were primarily used as supply ships, that could retrieve aircraft if needed. SWPA CP Fleet, Army CS ships provided communications relays and acted as command posts (CP) for forward elements ashore. CSM (Maintenance) ships, in addition to acting as CS ships, were also equipped for radio repair operations to supply floating maintenance. CSQ (Quarters) ships acted as floating dormitories. CSN (News) ships were used by civilian reporters. The Army had a history of submarine cable work by the time of World War II operations, dating back to the 1899-1900 period. Much of this work had been in relation to communications with far flung Army forces in the Philippines and Alaska. The Army Signal Corps used a number of cable ships for that work including Burnside, Romulus, Liscum, Dellwood and two vessels intimately associated with the Coast Artillery Corps controlled mine work at the coastal fortifications; Cyrus W. Field and Joseph Henry. That cable laying capability had been allowed to deteriorate to the point that the Army had to charter the C.S. Restorer in 1941. The Army entered the field of undersea cable work in connecting the military installations in the Philippine Islands. As with other cable work, some vessels were chartered. For example, the vessel Orizaba (not the later Army owned vessel of the same name) was under Army charter from the Pacific Coast Steamship Company before being lost in 1900. The first ship supplied by the Quartermaster Corps to the Signal Corps for cable work was the U. S. Army ransport Burnside. That Spanish–American War prize was replaced by the larger Dellwood for work with Alaskan cables. There is some confusion on ship designators within even official records. The conventional commercial and nautical term for such ships was “CS (name)” for “Cable Ship.” The mix of USAT, CS and even the simple “Steam Ship” (SS), as seen in postwar construction of the SS William H. G. Bullard, later the USS/USNS Neptune, can be somewhat confusing. All three terms are found in official usage. For example, Smithsonian Institution library records clearly show some of these Army ships as CS Dellwood and CS Silverado. Army ship management lay in the Quartermaster Corps and later the Transportation Corps. Technical management of the cable ships was under Signal Corps and the entire enterprise of undersea cable work was the very specialized realm of several large communications corporations which operated their own cable vessels and provided experts in handling cable equipment and cable. Each appears to have used familiar terms when noting the ships in records as seen in the Quartermaster reference, and records elsewhere. The nature of the work is such that specialized crews are required to operate the cable machinery and perform the actual cable splicing and technical work. The ex-Coast Artillery ships involved in mine planting were military crewed. CS Restorer was under charter and used civilians, many from its commercial crew, under Army contract. The remaining ships were probably mixed crews. Ten ships, nine being Maritime Commission type N3-M-A1 cargo vessel hulls being built at Penn Jersey Shipbuilding for the U.S. Navy or Lend Lease, were transferred to the Army for operation as Engineer Port Repair Ships. The other ship, first obtained for the purpose, was a commercial ship allocated by the War Shipping Administration (WSA). All the ships were managed and crewed by Army Engineers organized into Engineer Port Repair Ship Crew units, named for Army Engineers killed in action during WW II and heavily modified from their original design. Some of these were substantial vessels, 300 feet long, with a 3,000-ton displacement and a crew complement of 60-plus men. They were seagoing diesel-electric hydraulic dredging vessels, normally functioning under the Army Corps of Engineers control, and used for maintaining and improving the coastal and harbor channels around the U.S. coasts. During World War II, five seagoing hopper dredges already in civil service, were fitted with 3-inch deck guns and 20-millimeter antiaircraft guns. Four were sent to the ETO and last one, Hains, was sent to the Asiatic-Pacific Theater of Operations (PTO), along with the cutter dredge 'Raymond', additionally four new Hains-class armed dredges were constructed for use in the PTO. The U.S. Army Mine Planter Service (AMPS), under the Coast Artillery Corps, operated ships designated as U.S. Army Mine Planter (USAMP) to 'plant' the controlled mines guarding approaches to coastal fortifications. Numerous smaller vessels, not designated as USAMP, worked with the planters in a mine flotilla. ACyrus W. Field was a Signal Corps ship closely associated with mine cable work and sometimes listed with the planters. Joseph Henry was a cable ship transferred to the Coast Artillery Corps. Both were associated with the next generation of mine planter development that incorporated some cable capability into the 1909 and 1917 ships. Smaller vessels known as, "junior mine planters", or "pup planters", were occasionally employed as mine planters, but for the most part they served as freight and passenger boats for river and harbor duty. One source states the Army had 30 junior mine planters by 1919. Prior to World War II the Army operated a number of passenger and freight vessels for local transport between installations located on water. These were operated by the Quartermaster Corps. During World War I they were often used to transport troops from training camps to embarkation piers, particularly at the New York Port of Embarkation. For example, the 1918 registry, Merchant Vessels of the United States, under its Quartermaster vessels section lists some 33 small passenger and freight steamers, many former commercial vessels, ranging from the 72.1 ft (22.0 m) Peterson to the 185 ft (56.4 m) El Aguila. Among those in the 1918 register were Major L'Enfant, a steamer that served on the Potomac and burned in Baltimore on 3 December 1919 and General Meigs, a Quartermaster Corps passenger and freight steamer built in 1892 by John H. Dialogue & Son, Camden New Jersey, and serving in the early 20th century with a name given to much larger ships later. U.S. Army Cargo Vessel "FP-343" ("FP" later changed to "FS"), a "Design 381" (Vessel, Supply, Diesel, Steel, 177'), was later to become Navy's "T-AKL-34"
A class of small coastal and inter-island freighters during World War II were first designated "FP" for "freight and passenger" with early acquisitions being a variety of commercial hulls. Early in the war a number of designs were inaugurated. Some, such as "Design 277" (Vessel, Passenger-Cargo, Diesel, Wood, 114') were wooden hull while the "classic" "Design 381" (Vessel, Supply, Diesel, Steel, 177') was a miniature steel cargo vessel with two hatches and central booms. 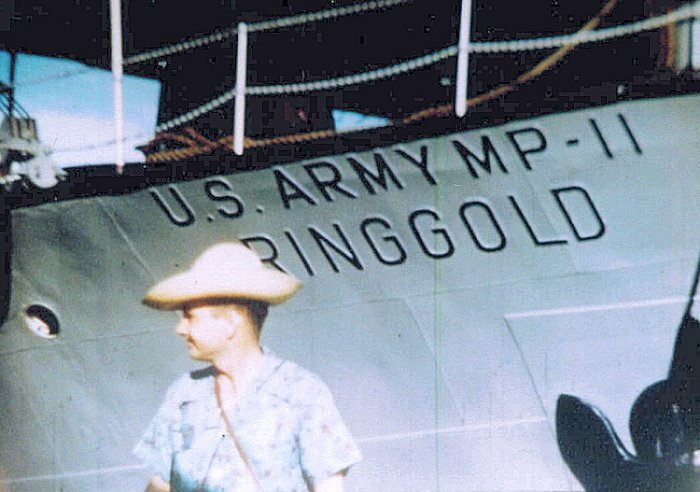 These, as with all the smaller Army ships, were simply designated "U.S. Army name (number)", and not designated U.S. Army Transport (USAT). They were operated by Transportation Corps with a variety of crewing schemes. A few were all military, many were civilian crewed and a large number were U.S. Coast Guard crewed. The USCG crewed vessels have more history preserved than most of these little ships. U.S. Army Cargo Vessel "FP-344" (redesignated "FS-344"). Transferred to the Navy in 1966, she became USS Pueblo (AGER-2). Mactan, an 1898 Newcastle built 312 foot long oil fired passenger/cargo vessel, was the first officially designated hospital ship in the Southwest Pacific and made a single voyage in that role evacuating severely wounded patients, nurses, students and other passengers from Manila, Philippines to Brisbane, Australia. Two Dutch vessels, Maetsuycker and Tasman, serving in the Southwest Pacific Area were operationally controlled by the U.S. Army but were certified as hospital ships by the Netherlands, maintained Dutch registry and flag. These ships have also sometimes mistakenly been shown as Australian hospital ships due to their close association with evacuating Australian troops. Ships known to fall in each of these categories appear in the list below. In general only ships owned, under long term bareboat charter or allocation to the Army, first through the Quartermaster Corps and later the Transportation Corps, were formally designated as a U.S. Army Transport (USAT). Those under other arrangements continued operating as SS NAME. Essentially all maritime commercial cargo and passenger type vessels were under strict control of WSA under Executive Order No. 9054. Exempted from WSA control were combatants, vessels owned by Army or Navy and coastal and inland vessels. The FS numbered vessels and Army tugs do not normally have "USAT" in their names. They and other smaller Army craft were simply designated as Army with "U.S. Army" over the number. Note: "Admiral' and "General" transports were P2 transport design variants, not an indicator of service affiliation. All the Navy's "Admiral" ships were transferred to the Army post war and were then renamed for generals. Those are found below under their Army names. Note: The newer, large transports of WW II named for generals were the P2-S2-R2 variant of the P2 transport design, not an indicator of service affiliation. All of the "Admiral" variants that were put into service were transferred to the Army after the war and renamed for generals. The Army did name a number of its non P2 type ships, many pre war, after generals. Army tugs were seen as far back as the American Civil War with the 1862 screw tug Terror. World War II era tugs came in two general classifications, though those were not rigid and variances may particularly be seen in commercial vessels taken in early during the war. Seagoing tugs, 92'-100' or greater were designated Large Tug (LT). Harbor tugs were Small Tugs (ST). The Transportation Corps determined that at war's end it was operating 746 tugs of the LT/ST types. A large number of highly varied commercial tugs were taken into Army service above those constructed to Army designs and Army tugs of prewar design dating to the early 1900s. In addition to these there were a variety of small towing craft, numbering in thousands, termed motor towing launches (MTL), sometimes overlapping the STs in length, and marine tractors of 40'and less length, some with the colorful name of "Sea Mules" with dimensions of 40 x 13 x 8 and two Chrysler gasoline engines. All were simply U.S. Army (LT/ST #). A construction program in Australia built a number of tugs for the Southwest Pacific Area in both LT and ST size. They were U.S. Army tugs, but not carried in the same central listing as the U.S. built tugs. A number of the tugs became Navy tugs after 1950. Only the first eight World War II-era LT numbered tugs built by Jakobson Shipyard, Oyster Bay New York, were given names during construction. The Army acquired commercial vessels or had in its inventory tugs early during WWII, before standardized design construction met requirements, that were LT in size which retained commercial names and did not have LT numbers. WWII LT construction did not use numbers greater than 935 with postwar LTs having four digit numbers until numbers starting with LT-801 were reused with 1993 construction. ^ "Port of Embarkation Essay--World War II in the San Francisco Bay Area: A National Register of Historic Places Travel Itinerary". www.nps.gov. ^ "The Mariners' Museum and Park - America's National Maritime Museum". The Mariners' Museum and Park. ^ "New York POE" (PDF). ^ a b c d e f Masterson, Dr. James R. (1949). U. S. Army Transportation In The Southwest Pacific Area 1941-1947. Washington, D. C.: Transportation Unit, Historical Division, Special Staff, U. S. Army. Retrieved 17 April 2013. ^ a b Morton, Louis (1993). The Fall Of The Philippines. Washington, D. C.: Center Of Military History, United States Army. Retrieved 18 April 2013. ^ "Military Sealift Command celebrates 50 years of service". ^ "Online Library of Selected Images: SHIPS of the UNITED STATES ARMY". ^ "USNS Sgt. George D. Keathley (T-AGS 35)". ^ "United States Army Transportation Corps". transportation.army.mil. Retrieved 14 January 2018. ^ "Army watercraft". globalsecurity.org. Retrieved 13 January 2018. ^ Verna, Thomas. "n Overview of USACE Dredging Operations" (PDF). USACE. Retrieved 12 March 2014. ^ "USGS OFR03-001: PHOTO GALLERY - Ships". pubs.usgs.gov. ^ a b Lunney, Bill; Finch, Frank (1995). Forgotten Fleet. Medowie, NSW, Australia: Forfleet Publishing. ISBN 0-646-26048-0. ^ Masterson, Dr. James R. (1949). U. S. Army Transportation In The Southwest Pacific Area 1941-1947. Washington, D. C.: Transportation Unit, Historical Division, Special Staff, U. S. Army. p. 530. ^ Lunney, Bill; Finch, Frank (1995). Forgotten Fleet: a history of the part played by Australian men and ships in the U.S. Army Small Ships Section in New Guinea, 1942-1945. Medowie, NSW, Australia: Forfleet Publishing. p. 147. ISBN 0646260480. LCCN 96150459. ^ Lane, Frederic Chapin (21 August 2001). "Ships for Victory: A History of Shipbuilding Under the U.S. Maritime Commission in World War II". JHU Press – via Google Books. ^ "Chapter 20: The Philippines: Leyte". www.history.army.mil. ^ "Trefoil (IX-149) Class". www.shipscribe.com. ^ Bauer, James L. "Pacific War, Special Ships". www.ww2pacific.com. ^ Bauer, James L. "Concrete Ship Hulks". www.ww2pacific.com. ^ "Floating Marine Repair Shop". grambo.us. ^ "Chapter XVII: The ASF and Civilian Agencies Concerned With Military Supply and Defense". www.history.army.mil. ^ "HyperWar: At Close Quarters [Part IV]". www.ibiblio.org. ^ "Shipbuilding History: Bay Shipbuilding Company, Sturgeon Bay WI". ^ Chandonnet, Fern (15 September 2007). "Alaska at War, 1941-1945: The Forgotten War Remembered". University of Alaska Press – via Google Books. ^ "The Signal Corps - The Outcome ( Mid-1943 through 1945 ) - U.S. Army Center of Military History". www.history.army.mil. ^ "U.S. Army transportation in the Southwest Pacific area, 1941-1947. :: General Military History". cgsc.cdmhost.com. ^ "US Army Small Ships in Australia during WW2". home.st.net.au. ^ "P04853.005 - Australian War Memorial". 25 September 2012. Archived from the original on 25 September 2012. ^ "P04853.043 - Australian War Memorial". 25 September 2012. Archived from the original on 25 September 2012. ^ a b c "History of the Atlantic Cable & Submarine Telegraphy - U.S. Armed Forces Cables". www.atlantic-cable.com. ^ "History of the Atlantic Cable & Submarine Telegraphy - U.S. Armed Forces Cables". atlantic-cable.com. ^ a b "US Army Quartermaster Foundation - The Work of the Army's Fleet by Col. T.M. Knox, QMC". ^ a b "Cable Laying/Repair Ship Photo Index (ARC)". www.navsource.org. ^ "Miscellaneous Auxiliary (AG)". www.navsource.org. ^ "History of the Atlantic Cable & Submarine Telegraphy - CS Restorer: Dirk van Oudenol". atlantic-cable.com. ^ "Dredging under fire". 13 May 2011. Archived from the original on 13 May 2011. ^ "Chapter 16 - The Corps of Engineers: The War Against Germany". www.history.army.mil. ^ "Wayback Machine" (PDF). 20 July 2011. Archived from the original (PDF) on 20 July 2011. ^ "Wayback Machine" (PDF). 23 July 2009. Archived from the original (PDF) on 23 July 2009. ^ "GALLERY - Littleships". littleships.org. ^ "Dredging Operations Technical Support Program - Historic Dredging Photos". 26 February 2011. Archived from the original on 26 February 2011. ^ "CHESTER HARDING - ShipSpotting.com - Ship Photos and Ship Tracker". www.shipspotting.com. ^ "FortMiles.org - Mine Field". www.fortmiles.org. ^ a b c d Berhow 2015, pp. 343–352. ^ Berhow, Mark A., Ed. (2015). American Seacoast Defenses, A Reference Guide, Third Edition. McLean, Virginia: CDSG Press. pp. 343–352. ISBN 978-0-9748167-3-9. ^ Clay, Steven E. (2010). US Army Order of Battle 1919–1941, vol. 2 (PDF). Fort Leavenworth, Kansas: Combat Studies Institute Press. p. 1177. ^ Clay 2010, p. 1180. ^ Clay 2010, p. 1186. ^ Clay 2010, p. 1188. ^ Clay 2010, p. 1193. ^ Clay 2010, p. 1181. ^ Clay 2010, pp. 1184–1185. ^ Clay 2010, p. 1189. ^ Clay 2010, p. 1191. ^ Clay 2010, p. 1194. ^ Clay 2010, p. 1182. ^ Clay 2010, pp. 1183–1184. ^ Clay 2010, p. 1178. ^ Clay 2010, p. 1179. ^ Clay 2010, p. 1187. ^ Clay 2010, p. 1192. ^ Clay 2010, p. 1195. ^ Clay 2010, p. 1196. ^ Clay 2010, p. 1197. ^ Clay 2010, p. 1198. ^ Clay 2010, p. 1190. ^ "NavSource photo showing USAMP name usage format". ^ Clay 2010, pp. 1175–1176. ^ Clay 2010, p. 1231. ^ Clay 2010, p. 1214. ^ Clay 2010, p. 1230. ^ Clay 2010, p. 1211. ^ a b Clay 2010, p. 1220. ^ Clay 2010, p. 1228. ^ Clay 2010, p. 1232. ^ Clay 2010, p. 1200. ^ a b "JMP Greeley - 1942". www.northamericanforts.com. ^ Clay 2010, p. 1201. ^ Clay 2010, p. 1202. ^ Clay 2010, p. 1203. ^ Clay 2010, p. 1204. ^ Clay 2010, p. 1210. ^ Clay 2010, p. 1212. ^ Clay 2010, p. 1226. ^ Clay 2010, p. 1217. ^ Clay 2010, p. 1224. ^ Clay 2010, p. 1205. ^ Clay 2010, p. 1206. ^ Clay 2010, p. 1207. ^ Clay 2010, p. 1225. ^ Clay 2010, p. 1227. ^ Clay 2010, p. 1208. ^ Clay 2010, p. 1209. ^ Clay 2010, p. 1213. ^ Clay 2010, p. 1215. ^ Clay 2010, p. 1216. ^ Clay 2010, p. 1218. ^ Clay 2010, p. 1219. ^ Clay 2010, p. 1222. ^ Clay 2010, p. 1223. ^ Clay 2010, p. 1229. ^ "Yard Mineplanter (YMP)". www.navsource.org. ^ a b c Fiftieth Annual List of Merchant Vessels of the United States, Year ended June 30, 1918. Washington, D.C.: Department of Commerce, Bureau of Navigation. 1918. pp. 496–497. Retrieved 17 December 2018. ^ "Gov't Steamer Major L'Enfant on the Potomac River approaching Camp Humphreys, Belvoir, VA May 1918 NARA111-SC-009889-ac". 1918. Retrieved 17 December 2018. ^ "2 Wharves, 7 ships destroyed by fire". Washington Times. 3 December 1919. p. 17. ^ Colton, Tim (May 18, 2016). "John H. Dialogue & Son, Camden NJ". ShipbuildingHistory. Retrieved 17 December 2018. ^ "Army FP/FS Vessels". Archived from the original on 12 February 2012. Retrieved 18 February 2012. ^ T. Colton (July 16, 2011). "Campbell Industries, San Diego CA". Shipbuilding History. Archived from the original on 19 October 2012. Retrieved 6 April 2013. ^ Smith, Clarence McKittrick (1956). The Technical Services—The Medical Department: Hospitalization And Evacuation, Zone Of Interior. United States Army In World War II. Washington, DC: Center Of Military History, United States Army. p. 410. LCCN 55060005. Retrieved 17 September 2014. ^ "WW2 US Medical Research Centre :: WW2 Hospital Ships". 26 July 2011. Archived from the original on 26 July 2011. ^ "WWII 1944 Hospital Ships History - Navies - Hospital". Scribd. ^ a b "War Shipping Administration Established by President Franklin D. Roosevelt Executive Order No. 9054". www.usmm.org. ^ "Army FP/FS Vessels". 12 February 2012. Archived from the original on 12 February 2012. ^ "The Cynthia Olson". www.artfiberglass.com. ^ Alaska service. Grover: grounded twice in 1943. VSC shows total loss, then revoked. ^ "HARBOR BOAT DESIGNATIONS WITH EXPLANATORY NOTES". Retrieved 17 February 2012. ^ a b c d e f g h i T. Colton. "U.S. Army Ocean Tugs (LT, ST) Built During WWII". Shipbuildinghistory.com. Archived from the original on 4 November 2011. Retrieved 9 March 2012. ^ T. Colton. "U.S. Army Ocean Tugs (LT, ST) Built Since WWII". Shipbuildinghistory.com. Retrieved 9 March 2012. ^ "Medium Harbor (YTM)". www.navsource.org. ^ "Auxiliary Fleet Tug (ATA)". www.navsource.org. ^ "JAMES A. HANNAH - IMO 5200289 - Callsign WU8842 - ShipSpotting.com - Ship Photos and Ship Tracker". www.shipspotting.com. ^ "MARY E HANNAH - IMO 5053777 - ShipSpotting.com - Ship Photos and Ship Tracker". www.shipspotting.com. This page was last edited on 10 March 2019, at 01:23 (UTC).